I can’t work out whether this is meant to be Sean Kennedy or L B Gregg. Actually I think both of them would be more snotty so it must be the Mumma. This entry was posted in extra further randomness, L B Gregg, mumma, sean kennedy. Bookmark the permalink. I was right. Being mean is how Kris shows she loves you. Wren: Have you somehow missed the Gleeky awesomesauceness that is Kurt and Blaine? Not to mention the sappy fangurls and boys that watch their clips over and over and over and over – you get the picture – again?? No of course I haven't missed that Gleekness. So your illustration is of either Sean or LB after a night of watching that clip, right? Wot you talkin' 'bout Sissy? Wren: I can't claim credit for this fabbo drawing. Unfortunately. But as I said in my post I think this is actually a pic of Mumma because there is no snot with all the tears. Mumma: Nothing. Nothing at all. BTW, how many times did you watch that clip of 'Baby, It's Cold Outside'? Okay, it's all clear to me now. Sorry – my head is still filled with fake Christmas snow. Your mumma is a lucky woman to be able to cry without snotulation. Still. I envy the skill. Baby, it's coooold ouuut siiiiiiiide. I see you are back your terrorising ways..
Business as usual then for 2011..
LB: And how many times have YOU played that clip, Sweet Bea? Maybe I should run a comp between you, Sean and the Mumma to see who is the biggest Klaine fan? Kurt and Blaine are finally go to smooch on a special Valentine's Day episode. But should this be the German soap opera instead of Glee? KBC: Did you see the Mumma's and LB's comments and Sean's tweets on the subject?? It's definitely Glee. I'm glad said she didn't get it first, 'cause I spent ages staring at the picture, going huh? 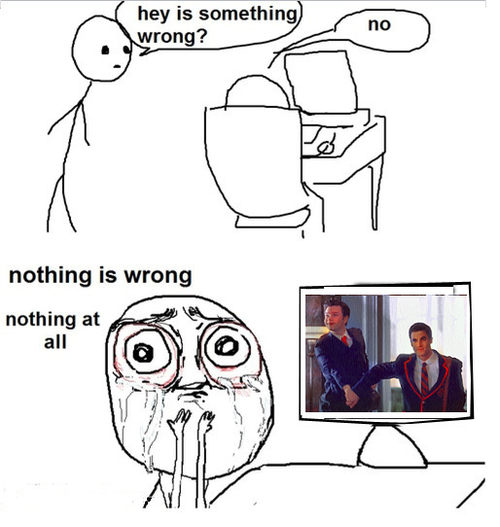 Orannia: What kind of a Gleek are you?! Geez. And Jeebus, at least we're not on the Brian and Justin train. I'm so fricking sick of hearing about those two narcissistic unlikable shits who only should have ended up together because nobody else deserved to suffer the rest of their lives with them. Kris, I used to feel sorry for Sean because of the way you treat him. Now that he has denigrated my sweet Brian and Justin, I realize why you have acted the way you have. Obviously, Sean provoked you. Kris, everything you've done must have been in self-defense and was justified. Eyre: He is dead to me. Also, I told you so. I'm sorry. Did someone just type something?? Kris, I think your blog has been hit by one of those weird spambots that just posts nonsense. I think you're right, Eyre. That would be the only logical explanation.